If you’re in the mood for a special dinner and you have a farm-to-table restaurant in your city, it might be one of your favorite options. The farm-to-table movement promises locally sourced, fresh, delicious things, prepared with care and served enticingly. I’ve recently started using “farm-to-table” to describe my approach to content marketing, and here’s why. No matter what kind of food you like, from a fancy restaurant to a great taco truck, excellent meals start with excellent ingredients. For copywriters and content marketers, there’s no more valuable ingredient than a profound understanding of your potential customer. That’s why great copywriters and smart businesspeople are obsessed with their audiences. How do they talk about it? Which specific words do they choose? It’s really hard to create a delicious meal without fresh, delicious ingredients. And it’s almost impossible to put together a high-converting content marketing strategy unless you’ve collected lots of fresh, delicious customer details to inform the words you put together. I won’t name the restaurant, but I once had a farm-to-table meal in Devon, England that I had looked forward to all day. Fresh, local lamb. Honey collected on-site. Baby vegetables picked that morning on farms no farther than 30 miles away. And when it was all put on the table, the lamb was overcooked, the honey was overused, and the baby vegetables had been turned into a sad, flavorless mush. You absolutely can wreck beautiful ingredients by cooking them without skill or care. Excellent copy and content need a skilled writer to put the messages together. Smart conversion strategy is a must, because the most compelling content on the planet won’t help your business if it’s not structured to convert. Too many businesses today handle content and conversion as two entirely different functions. They reserve most of their budget for the “bottom of the funnel” copy on the sales page and the last few emails leading to it. Then they cheap out on content and on the work that attracts and engages the audience. Or they slap something together just to get some words into the content calendar. But even a great sales page will struggle to convert an audience that doesn’t really get the value proposition and isn’t in the right stage of customer awareness. Whether you’re a business owner who handles your own content or you’re bringing on a writer to handle that for you, I’m increasingly a convert of a unified voice and tone throughout. 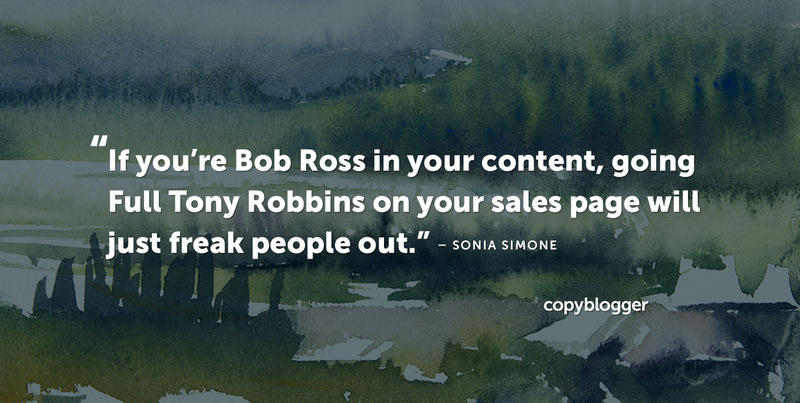 If you’re Bob Ross in your content, going Full Tony Robbins on your sales page will just freak people out. If you’re a business owner hiring writers, look for a writer who can write across the entire customer journey — creating enticing, effective work all the way from farm to table. If you can’t find a writer like that (here’s a good place to look), get a team together who will work in tandem so there are no jarring spots where the tone changes dramatically. And if you are that writer, whether working freelance or inside a company — get great. If you specialize in content, don’t be afraid to learn about sales pages, conversion emails, and social media ads. Those strategic skills are an ultra valuable addition to your ability to write creative and engaging content. If you could use some help with the business-building side of content marketing, we have resources that can help. Start by checking out the new Copyblogger Education page. It details courses you can access today to start crafting your own high-converting content marketing. This is great stuff, Sonia. If the content doesn’t strike emotional chords with your audience, then it isn’t going to move the needle; how much so ever traffic you might get! I love your analogy and especially the statement, “unless you’ve collected lots of fresh, delicious customer details to inform the words you put together.” It all comes down to interacting with your target audience and doing your research. That’s what makes you audience-first, anyway, right?